I had a less than productive shopping day yesterday and as a result, was unable to find a can of spray Matt varnish. That means that the vehicles for Number 6 Platoon will have to remain shiny until I can find some. The troops, however, will be getting a brush-on, Matt varnish this week while I am on a week's holiday (YAY!). Yes, the next platoon is ready to start receiving their paint. I haven't started on the vehicles because they will distract me...and I won't be doing so until these are glossed, ready for decals so it is a fair way off. I have chosen the 8th platoon because I have enough decals for the vehicles. I expect that the next one will probably be the 5th platoon for the same reason. Nice and easy to see and nice and easy to paint. 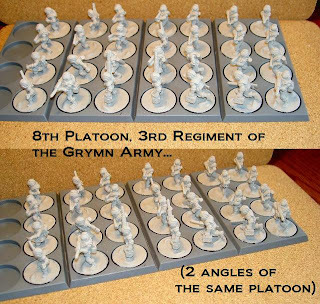 I have a feeling that things will be fairly quiet here for a while as I paint up the sections for the up-coming platoon but fear not...if anything else turns up, I will let you know. That looks pretty good. The grymm look grim! They'll look much better when they are all Matt though... shiny paint adds smiles to miniatures. Excellent painjob Inso, I really like your colour choices. The varnish seems a bit glossy, but perhaps that's from the lights needed to take the photos. The pics were taken before the matt coat went on. Even with the matt coat, they are still more satin than matt...which is a little disappointing :(. I understand your pain, happened to me also, but don't worry too much about it -It should be absolutely fine (and barely noticable :).